Take your party planning to the next level by including a few blinged out party decorations. While the word "bling" originally meant the noise made by two pieces of jewelry knocking together, it's come to mean anything bejeweled, glamorous or over-the-top fabulous. If you're decorating on a budget, these DIY party decorations will help bring the bling, without bringing a hefty price tag to the party. Display groups and bunches of glittering silver and gold branches in vases and buckets around the room or place a few together in a centerpiece for the table. Gather together several sticks and branches of varying lengths and sizes. Make sure they are dried and have no leaves attached. 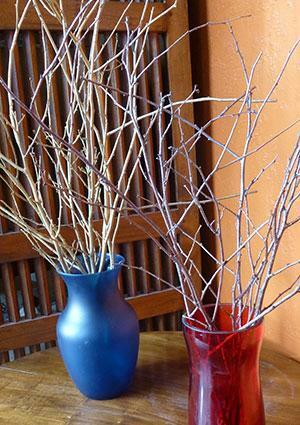 Trim off any small twigs as desired. Lay out the branches on top of some newspaper. Make sure they do not overlap one another. Spray them with either gold or silver glitter spray paint, sweeping the spray paint over them to get good coverage without any drips. Allow the paint to dry, then flip over branches and spray the other side. Let them dry, then arrange them in groups around the room. Add a little sparkle to some candlestick holders, or votive candle holders and scatter them around the room or on top of the dinner table. 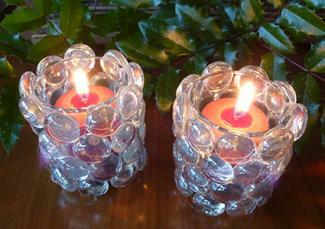 When the candles inside are lit, the flames will reflect off the glass pebbles, making them sparkle. Make sure the outside of each of the holders is clean and dry. Glue the glass pebbles to the exterior of the holders in rows so that they are covered completely. Clean away any stray glue strings and place a candle in each one. 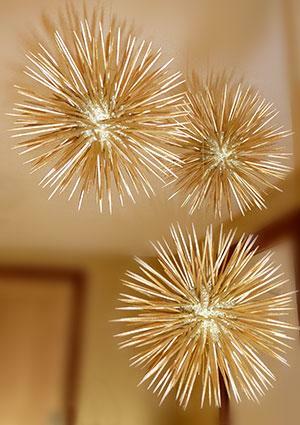 Hang these fun glittering balls above your table, in doorways, or anywhere you want a little extra sparkle. Spray the Styrofoam balls with gold glitter. Set them aside to dry. Lay out the toothpicks in a single row and spray them with the solid gold spray paint. Let the paint dry, then flip over the toothpicks. Spray the other side. Insert the toothpicks into the Styrofoam every few millimeters so they completely cover the ball and make a sparkling sun or star. Glue the end of a piece of fishing line to a toothpick to hang. In addition to the items you may choose to make yourself, there are also lots of party decorations out there that are perfect for an over-the-top bash. Consider using any of these ideas the next time you plan a party. UltraPom: UltraPom has a large, 50 x 102-inch champagne sequined tablecloth. The sequins are on mesh, so you will need to use an underlay beneath them. The tablecloth retails for $35. Candy Crush: Candy Crush makes sequined tablecloths in a wide range of sizes and colors, including pink, turquoise, gold and silver. Pricing ranges from $45 for a runner to about $230 for a 6-foot cloth. They will also make tablecloths to order. Silver Three-Tier Chandelier: The Silver Three Tier Chandelier from Stumps is made of Mylar strands hanging from silver chains. 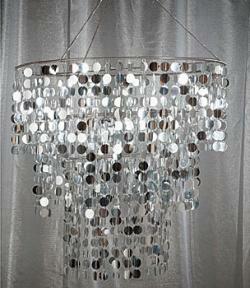 It measures 28-inches in diameter, and hangs 3-feet. It retails for under $30, and customers love it for its looks, ease of hanging, and the fact that it's lightweight. Deluxe Hanging Crystal Garland: The Deluxe Hanging Crystal Garland from Koyal is 8-feet in length. It's constructed of acrylic crystals pieced together with silver rings. The crystals vary in size and shape from rectangles to octagons. It retails for under $15 and bulk discounts are available. 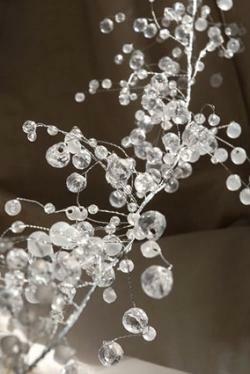 Wired Crystal Garland: The Wired Crystal Garland at Save-On-Crafts measures 42-inches in length, and can be fluffed out to approximately 4-inches in width. The crystals are all positionable, so you can customize the look you get once it's hung. They sell for $9.99 each or 3 for $24.99. BeauCoup: BeauCoup has an assorted package of crystal/diamond table scatter. Each package contains six pieces in varying sizes. The packs sell for $13.44 for one, or $12.09 for 12 or more. FDC: FDC carries numerous colors and sizes of gemstone table scatter. Their acrylic scatter comes in solid colors, such as blue, red or pink, or in multi-color packages like red and green. Pack sizes vary from 3 ounces to 1 pound and prices range from under $3 to under $10. 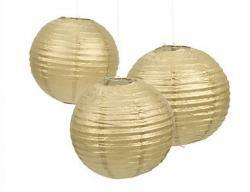 Oriental Trading: Oriental Trading sells packs of six gold paper lanterns for $10 a set. The lanterns measure approximately 12-inches and come with a wire for hanging. Paper Lantern Store: The Paper Lantern Store carries silver glitter paper lanterns for $5.95 each, with bulk pricing available. Each lantern measures 12-inches in diameter and lighting options can be purchased separately. Whether you're planning a New Year's Eve bash, or a birthday party for a friend, adding a few party decorations with some bling will help make it a memorable occasion. Try any of these ideas for party decorations with bling and help make your party into something special.